We’re making a big investment in routing starting in 2.2 to make it interoperate more seamlessly with middleware. For 2.2 this will start with us making a few changes to the routing model, and adding some minor features. In 3.0 the plan is to introduce a model where routing and middleware operate together naturally. This post will focus on the 2.2 improvements, we’ll discuss 3.0 a bit further in the future. So, without further ado, here are some changes coming to routing in 2.2. The new routing features will be on by default for 2.2 applications using MVC. UseMvc and related methods with the 2.2 compatibility version will enable the new ‘Endpoint Routing’ feature set. Existing conventional routes (using MapRoute) or attribute routes will be mapped into the new system. an option. We’ve tried to make the new endpoint routing system as backwards compatible as is feasible. 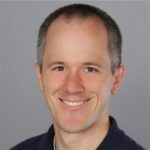 Please log issues at https://github.com/aspnet/Routing if you encounter problems. We don’t plan to provide an experience in 2.2 for using the new features without MVC – our focus for right now is to make sure we can successfully shift MVC applications to the new infrastructure. HttpContext. For right now the set of things you can link to is limited to MVC actions, but this will expand in 3.0. IUrlHelper) for now — but it’s usable anywhere in your application. We plan to expand the set of things that are possible during 2.2. 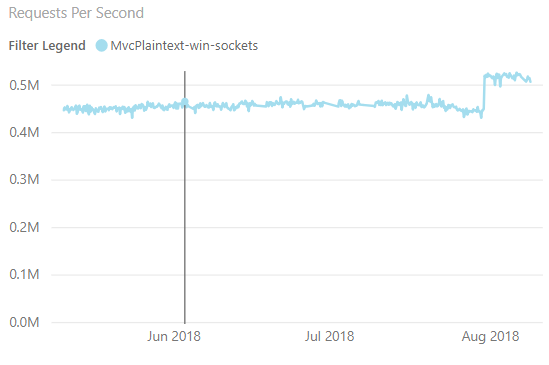 This chart shows the trend of Requests per Second (RPS) of our MVC implementation of the TechEmpower plaintext benchmark. We’ve improved the RPS of this benchmark about 10% from 445kRPS to 515kRPS. To test more involved scenarios, we’ve used the Swagger/OpenAPI files published by Azure and Github to build code-generated routing benchmarks. The Azure API benchmark has 5160 distinct HTTP endpoints, and the Github benchmark has 243. The new routing system is significantly faster at processing the route table of these real world APIs than anything we’ve had before. In particular MVC’s features that select actions such as matching on HTTP methods and [Consumes(...)] are significantly less costly. We’re also using this opportunity to revisit some of the behaviors that users find confusing when using attribute routing. Razor Pages is based on MVC’s attribute routing infrastructure and so many new users have become familiar with these problems lately. Inside the team, we refer to this feature as ‘route value invalidation’. Without getting into too many details, conventional routing always invalidates extra route values when linking to another action. Attribute routing didn’t have this behavior in the past. This can lead to mistakes when linking to another action that uses the same route parameter names. Now both forms of routing invalidate values when linking to another action. [Consumes(...)], versioning, and other policies that used to be part of MVC’s action selection process. In contrast to this, the existing routing system models the application is a list of ‘Routes’ that need to be processed in order. What each route does is a black-box to the routing system – you have to run the route to see if it will match. To make MVC’s conventional routing work, we flatten the list of actions multiplied by the number of routes into a list of endpoints. This flattening allows us to process all of MVC’s requirements very efficiently inside the routing system. * * *The list of endpoints gets compiled into a tree that’s easy for us to walk efficiently. This is similar to what attribute routing does today but using a different algorithm and much lower complexity. Since routing builds a graph based on the endpoints, this means that the complexity of the tree scales very directly with your usage of features. We’re confident that we can scale up this design nicely while retaining the pay-for-play characteristics. LinkGenerator API in the next preview. We want to make sure that this new API will support a variety of scenarios for the foreseeable future. https://github.com/aspnet/Routing What are you using IRouter</span> for? The ‘Endpoint Routing’ system doesn’t support IRouter-based extensibility, including inheriting from Route. We want what you’re using IRouter for today so we can figure out how to accomplish those things in the future. What are you using IActionConstraint for? ‘Endpoint Routing’ supports IActionConstraint-based extensibility from MVC, but we’re trying to find better ways to accomplish these tasks. What are your ‘most wanted’ issues from Routing? We’ve revisited a bunch of old closed bugs and brought back a few for reconsideration. If you feel like there are missing details or bugs in routing that we should consider please let us know. https://github.com/aspnet/Routing. DataTokens are not supported in 2.2.0-preview1. We plan to address this for the next preview. By nature the new routing system does not support IRouter based extensibility. Generating links inside MVC to conventionally routed actions that don’t yet exist will fail (resulting in the empty string). This is in contrast to the current MVC behavior where linking usually succeeds even if the action being linked hasn’t been defined yet. We know that the performance of link generation will be bad in 2.2.0-preview1. We worked hard to get the API definitions in so that you could try it out, and ignored performance. Expect the performance of URL generation to improve significantly for the next preview. Endpoint routing does not support WebApiCompatShim. You must use the 2.1 compatibility switch to continue using the compat shim.